The wail of passing sirens, honking horns and thumping car stereos swirls into a jarring soundtrack as pedestrians dart between slow-moving cars before ducking into the barber shops, cellular phone stores or Spanish groceries that dot the landscape. Busy South Broadway, the main thoroughfare that runs through the heart of Lawrence, Massachusetts, connecting it with affluent Andover to the south and working-class Methuen to the north, is teeming with its usual Saturday activity. Above the din, however, Gaëtan Demers is immersed in a sea of silence. Tucked away in his second-floor workspace, he labors over a gear wheel that refuses to slip into place inside the back of a pocket watch he is restoring. Demers swivels away from his work for a moment, a sheepish smile creasing the corners of his mouth as Darling, his African Gray Parrot, begins to meow like a cat, just as Buddy the cat strolls past to greet a visitor. Each creature maintains a safe distance from the other. The cat is usually relegated to Demers’ living quarters and music studio area, located toward the back of the building, only occasionally making an appearance in the workshop. Darling pretty much has the run of the workshop. He spends his days perched atop his large steel cage, often positioning himself right next to the “Beware of Attack Bird” sign that appears to be hung only half in jest. The playful mocking of the cat belies the beast’s churlish behavior. Darling’s steely glare, however, does nothing to debunk this notion: there is no misunderstanding taking place. 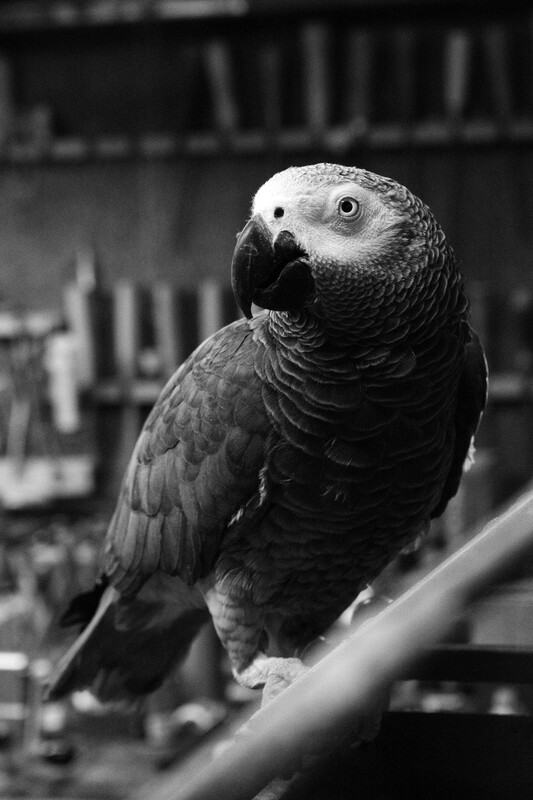 Darling, an African Gray Parrot, keeps a watchful eye on things. For 32 years, this space has been home. In a world in which the time of day is accessed with a quick glance at a cell phone, Demers is among a dying breed of craftsmen slowly falling under the crushing wheels of technology. 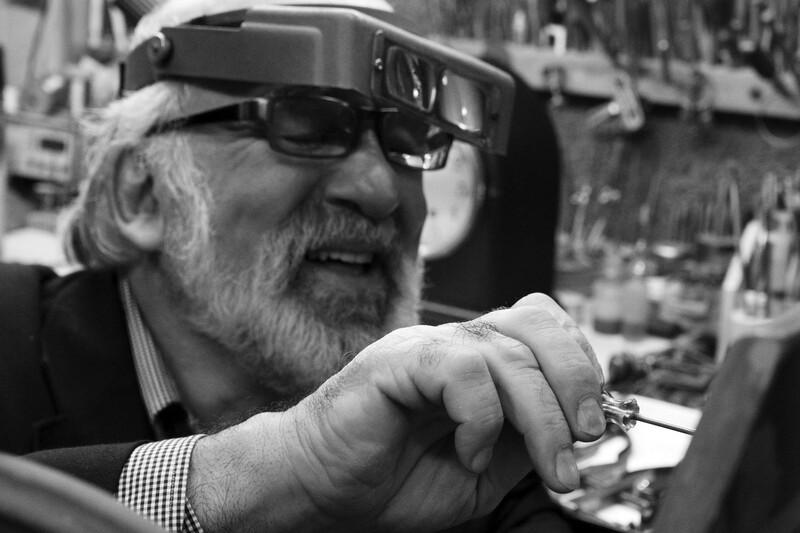 Customers of G. Demers Fine Watch and Clock Repair put their faith in Demers’ expert craftsmanship and painstaking attention to detail to keep their timepieces and family heirlooms ticking. It is a place where time literally stands still, but it’s Demers’ job — and his customers’ requests — to make sure it restarts. On the surface, technology may have seemed to pass Demers by. He has no website advertising his business; nearly every one of his customers has found him via word-of-mouth or in the Lawrence area telephone book. 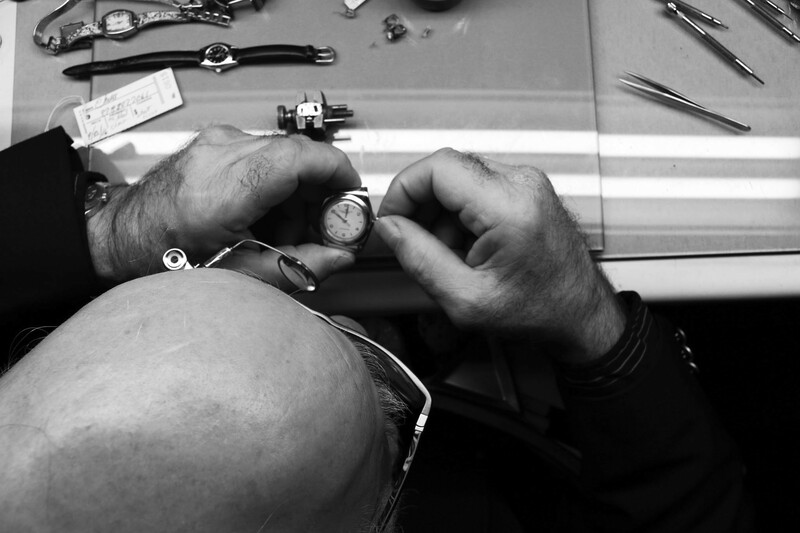 According to the American Watchmakers and Clockmakers Institute, the number of full-time watchmakers in the United States stands between 9,000 and 10,000, several thousand less than there were a decade ago, and the average age of a watch repairer is between 50 and 60. As World War II was drawing to an end, there was a surge in the creation of watchmaking schools around the country, providing a trade opportunity for the many veterans trying to become reintegrated into society. By the 1970s, most of those schools — some with upward of 100 or more students — had been shuttered, mostly because the trend toward more sophisticated machinery within the industry, aimed at increasing the average worker’s production, had driven many toward other career paths, including emerging electronic technologies. Then, in 1982, the production of digital watches exceeded for the first time that of mechanical timepieces, and the need for an understanding of the intricate workings of gears, mainsprings and movements became less important. Quartz watches usually required nothing more than a fresh battery to keep accurate time. Inexpensive digital watches that were cheaper to replace than repair lessened the demand for craftsmen. But using the skills he learned as a 17-year-old apprentice in the clock repair shop his father opened after relocating the family from Quebec, Demers’ business continues to thrive, drawing a loyal base of customers from across the Merrimack Valley and southern New Hampshire, and at least one from as far away as California. 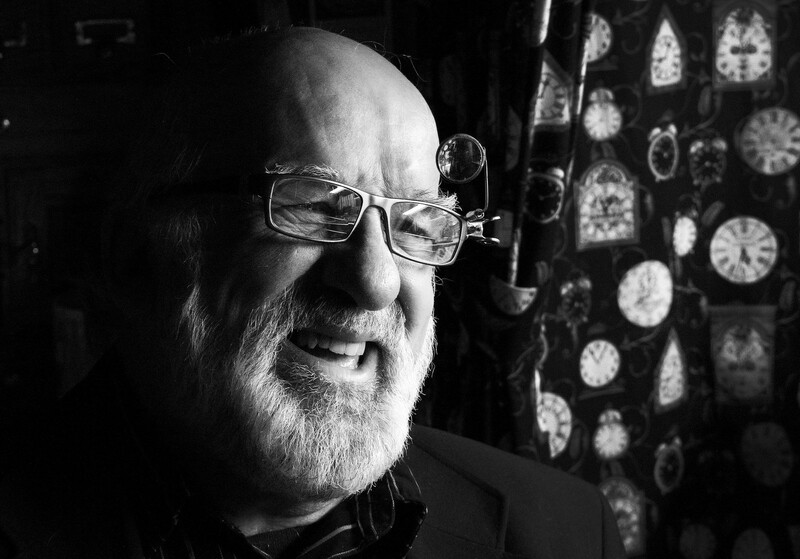 “As long as people still use watches, there will be a need for people like me,” Demers says. “When people come in, you can tell how much a piece means to them. It could be something that’s been in their family for generations or something that has a special meaning to them. Sometimes it’s just the sentiment attached to the piece — it may have been their father’s or grandfather’s. It’s their connection to that person. And being able to get that watch or grandfather clock working again, you can see the joy it brings. Demers works on watches in the morning, when his eyesight is sharpest. Plessisville, Quebec, a small town located about 60 miles southwest of Quebec City, is known as the World’s Maple Capital. Each spring since 1958, the town of about 6,700 residents has hosted Le Festival de L’Érable de Plessisville, a celebration of all things maple, including a public market featuring cooking demonstrations, a tasting tour, a maple museum, and exhibitors. Maple syrup is a huge cog in the province’s economic wheel, with Quebecois maple syrup accounting for 85 percent of Canada’s $300 million export of the product in 2014. Quebec-made maple syrup accounts for 75 percent of the global market; by contrast, Vermont, the largest producer in the United States, accounts for about six percent. In the early 1960s, however, Demers’ ever-growing family was struggling to make ends meet. Jean-Paul and Mary Jeanne had 14 children — six boys and eight girls — and the struggle to keep them all fed and clothed was a challenge. Jean-Paul owned a small shop in town that sold a little bit of everything, anything to make a buck. A gifted photographer, he also tried to book as many photo shoots as he could to help augment his income. But resources were running thin. Demers’ two eldest brothers left Quebec and headed south in search of work, landing in Lawrence. They let their father know that there were plenty of employment opportunities in the blue-collar city along the Merrimack River and, in 1962, Jean-Paul and Mary Jeanne made the decision to pack up the rest of the brood and join them, when Demers was 11 years old. Jean-Paul first found work at Royal Watch Repair, using skills he learned as a youngster, when he’d pedal his bicycle into town, gather residents’ timepieces and repair them with tweezers fashioned from an errant piece of tin roofing material and a screwdriver whittled down from a broken-off pitchfork prong. Bolstered by a solid reputation and desire to run his own place, Jean-Paul opened his own watch and clock repair shop on Tremont Street, just off Broadway. It was a line of work that piqued Demers’ interest, even as he toiled in early jobs as a glass cutter and cabinet maker. When he was 17, Demers started to work part-time for Jean-Paul. A guitar is never very far from Demers’ reach. The walls of the recording studio Demers built for himself are lined with electric and acoustic guitars. Some he’s made, some he’s bought, some he’s rehabbed. This is Demers’ Eden, a place to which he escapes to strum a few cords or maybe belt out a version of Merle Haggards’ “A Working Man Can’t Get Nowhere Today” or Waylon Jennings and Willie Nelsons’ “Mammas, Don’t Let Your Babies Grow Up to Be Cowboys,” a song he performed back in the 1970s during an appearance on “Community Auditions,” a long-running regional talent show on WBZ-TV. He’s partial to old-school country like Nelson, Jennings, Chet Atkins and Johnny Cash, but he enjoys playing flamenco and Spanish music as well. He plays the occasional gig at a local coffee shop or country club, and not long ago he performed at Tupelo Music Hall, an intimate setting in Londonderry, New Hampshire, that hosts local and regional talent as well as national touring acts. Eventually, Demers hopes to go into the studio and record some of his own material, maybe this summer. It’ll be something to leave behind, he says. Music might get his toes tappin’, but watch and clock repair are what pays his bills. Demers makes an adjustment to the face of a clock in his Lawrence, Mass., shop. Demers’ meaty and calloused hands seem incongruous to his trade. Rugged and weathered, they are the implements of a craftsman whose work is far less delicate. 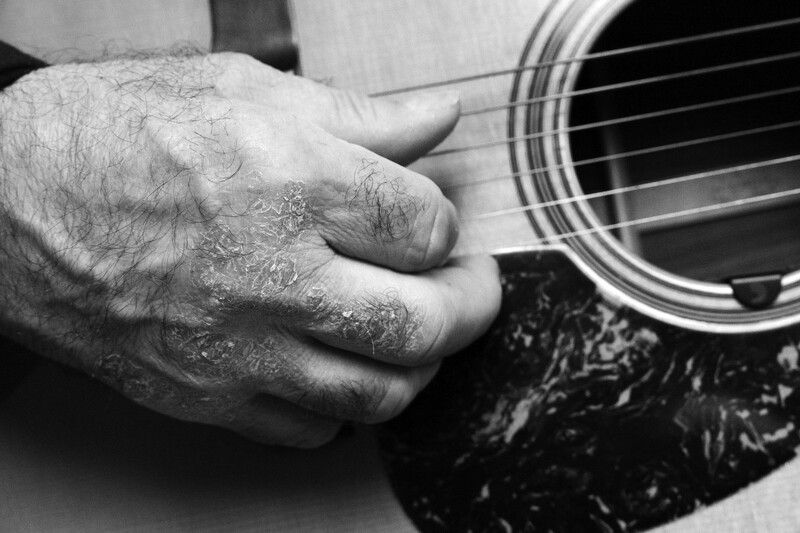 But the same hands that can carve, sand and detail a sturdy bookcase or cabinet are equally adept at strumming a guitar or bringing the gummed-up gears of a long-dead pocket watch back to life. He’s come a long way since he was repairing timepieces out of a suitcase in a Lawrence rooming house. As he became more established and eventually opened a shop along Broadway with nothing more than a small desk and mattress tucked into the corner, his skill and precision helped open the door to opportunity. His father would send Westminster chime clocks and other pieces over from his shop because he knew no one could get them running better than Demers. “He used to say, ‘Look at him. He’s gonna be good. He’s gonna be good’, ” Demers says. The thought brings a smile to Demers’ face. Today Demers’ shop is the only one of its kind in Lawrence. With every new piece that comes through his door, the art and precision of the work present a new challenge. He concentrates on watches in the morning, when his eyes are still fresh, before switching over to clocks in the afternoon. Demers figures he’ll be working on watches and clocks “until I kick the bucket, till I can’t do it no more.” He’s been spending time with his grandson, trying to teach him the tricks of the trade. Like Demers when he was young, his grandson loves to take things apart and see how they function. Steve Daly is a longtime journalist and author of “Dem Little Bums, The Nashua Dodgers.” He can be reached at steve-daly@comcast.net. Meredith Derby Berg is a freelance video journalist and writer based in Greater Boston reachable at meredith@mdbvideo.com. Award-winning journalist and freelance writer, author, photographer.